First and foremost we pride ourselves on our charcuterie products. We hand craft everything in house but the cheese. 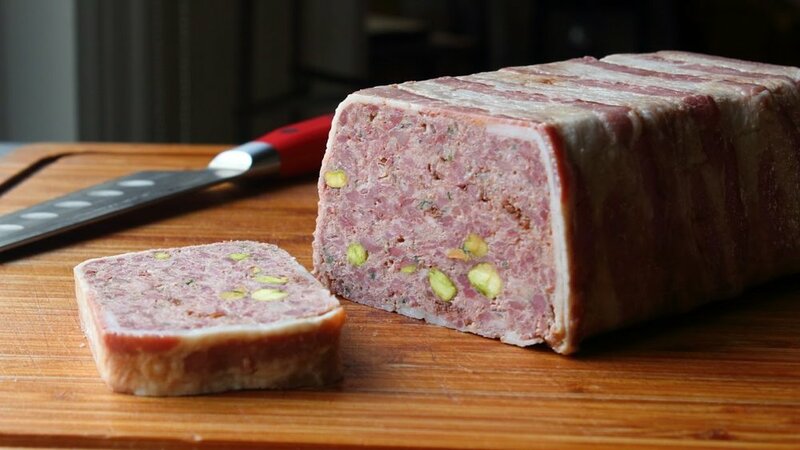 Our "Pate de Campagne" is one of our most popular items. Pork shoulder, liver, pistachios, and aromatics are ground, mixed, shaped and slowly poached to perfection. Approriate in all seasons, in the summer serve it with some fresh pickled cherries or apricot chutney or in the winter with caramelized onions and walnuts. Personally I wedge a generous slab between the heel of one of Monikas extra crusty baguettes for breakfast prior to most Saturday farmers markets. Drying sausages and making salume is a very long and delicate task. some of our products take up to 12 weeks to prepare from start to finish. Our ever evolving line of Saucisson Sec is our signature. We believe the french have some tried and true knowledge on the subject of dried sausages, the fewer ingredients the better. Esspelette Pepper, Provencal Herb, Garlic, Truffle or Peppercorn are some of my favourite saucisson sec that we make. Simply good pork, sea salt, a delicate possibly seasonal flavouring ingredient and time. Our deli products are proudly produced in house, by hand. These include all of our deli hams such as old fashioned, honey ham, roast beef, black forest ham, and peppered ham. As well as our cold cuts such as pepperoni sausage, cooked salami, summer sausage, and bavarian meatloaf. Weddings, family reunions, corporate gatherings or even just a Sunday bbq. We can help you feed up to 300 guests without even breaking a sweat! and we'll even let you take the credit. We can create a platter no-one will forget. From 10 to 200 guests including house cured meats, cheeses, condiments, olives and pickles. Customized to your desires. Try our slow roasted beef dip "au jus". Dry aged local beef, seasoned and roasted to perfection. Sliced thin and ready to just heat and serve with our in house made jus. Our southern style BBQ pulled pork is another crowd pleaser. Rubbed with our house blend of herbs and spices and smoked for 12 hours over hardwood smoke. Pulled and sauced, ready to heat and serve. We offer many varieties of sausages made just for you out of your own wild harvest or domestically raised meat. We accept meat for processing on Fridays between 10am and 4pm. From January 1st until November 15th.